I still have my maiden name even though my husband and I have been married over 10 years. The thought of changing to my husband's name was never something that I ever really though about. My husband and I were both working on our master's degrees when we got married and professionally it made more sense to keep my maiden name. Plus I joked with my husband that I wasn't property and there was no reason I needed a new identity just because we got married. Oftentimes I have to explain to people that yes my husband and I are married, no I did not change my name. Honestly, I find the whole thing a big hassle and not something that makes my marriage any stronger. A commitment is a commitment whether I took his name or not. I'm no more likely to get divorced due to a different last name than if we shared the same. My oldest uses my different last name as a source of pride, he tells people that his mommy is strong enough to be different. I love his saying and it's the perfect description of how I run my life and the values that I want my kids to understand. A unifying bond has nothing to do with a shared last name, it has to do with the love that connects the people within it. One thing that brings my family together is dessert. We all love dessert. My husband is picky about the kind of dessert, but my kids and I will pretty much eat anything with sugar. Since sugar should be eaten in moderation, we don't enjoy dessert all the time. When I do make sweet goods I also try to modify the ingredients to be healthier by using alternative flours and natural sugars. 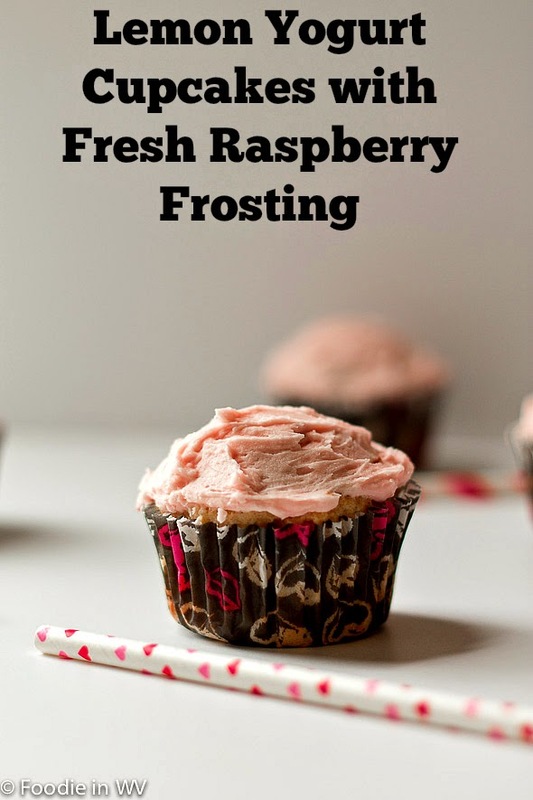 Recently I tried a new recipe for Lemon Yogurt Cupcakes with Fresh Raspberry Frosting. The recipe is as follows. In a separate bowl combine butter, sugar, and lemon zest. Beat with a mixer on medium speed for 3 minutes. Add in lemon juice, vanilla, and egg. Slowly add flour mixture to wet ingredients. Add yogurt just until the batter comes together. In a paper lined or greased muffin tin add the batter to each cup 3/4 of the way full. Place berries and sugar in a food processor and puree. Using a sieve or cheesecloth pass mixture through pressing out solids. Beat butter until fluffy, approximately 2 minutes. Add sugar 1/2 cup at a time. Add berries until frosting is light and fluffy. Paper liners make it much easier to take the cupcakes out of the muffin tin. I have used both Greek yogurt and regular and they both worked well, plus the Greek yogurt has added protein. Don't worry if a few seeds get into the frosting, after they are pureed in the food processor they really aren't noticeable. I tried the frosting with a small amount of almond extract and it was delicious. A small amount of vanilla extract would also work. Haha you make me laugh Ann! But I understand you ! I nevet used my hubby name, i dont know why maybe I dont feel necessary and all my life Iused my own name. Anywsy my hubby never said nothing about. I agree, a name is just a name :) My husband was fine with me not changing mine. Thanks for the nice comment about the cupcakes! 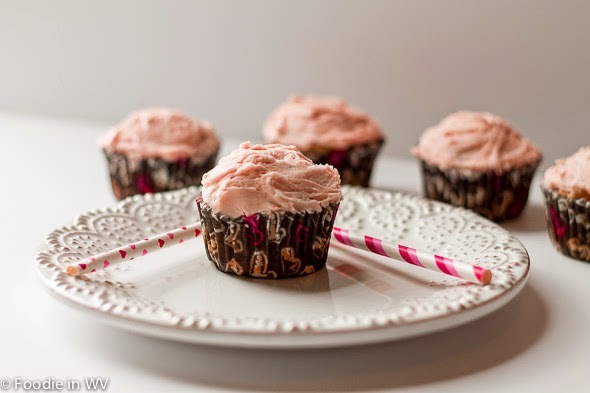 I love that you made these cupcakes with wholewheat and the raspberry frosting sounds and looks really divine. I try to use whole wheat when I bake for my kids. They mostly eat gluten free like i do, but I do allow them a few treats with wheat flour. lemon and yogurt...sold! these sounds delish! i once read about a guy who took his wife's last name. i thought that was great! but whatever people choose, you're right, a commitment has nothing to do with a name change. I don't think my husband would have wanted to take mine, but you never know :) The lemon and yogurt together are nice and it cuts down on the fat, which is always good! I took my husband's name, but it was mostly because my maiden name is so long that I couldn't wait to get rid of it. I don't blame you if it was really long, that would be annoying to have to write out all the time :) My maiden is short, so it wasn't a big deal. The cupcakes look awesome, they must be very fresh-tasting. Interesting about your name, I took my husband's and never thought twice about it. I think it's fine either way, though. Your name is your name, you can keep it if you want to do so! I always over think everything, I blame my liberal arts degree :) Thanks for the sweet comments about the cupcakes! I'm with you about the last name thing. I don't think it's a big deal. Guys who act like babies when hearing their future wives don't want to change their last names need to get off their macho high horses. Some men seem to make it a bigger deal than it needs to be. It made sense when last names actually meant something like Kennedy, Rockfeller etc, but unless you are marrying into a family with a name I don't see the point. I so feel you on that name change. I added my husband's to my last name and have them both together. I didn't want to lose my identity completely. Who came up with that bright idea anyway of totally giving up your name? Oh those cupcakes look amazing and we're big cupcake lovers here. I am so going to give this recipe a shot and hope it comes out as good as yours do. I know a lot of people that have done what you did. I like the idea of having both, that way you have both identities. 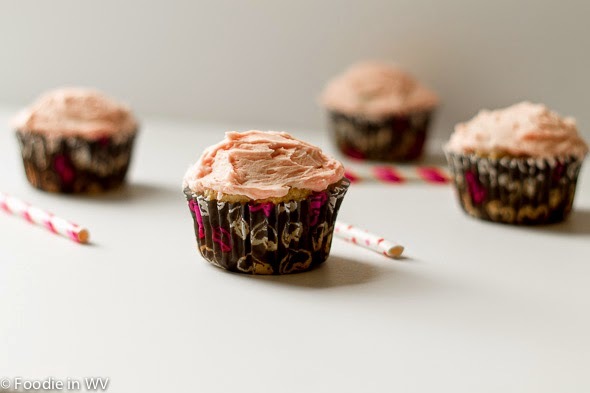 We are cupcake lovers as well :) If you try the recipe tell me how it turns out! Just coming over to wave hello and see what goodies you've got posted. These cupcakes look mighty tasty! I have been so behind on everything, I am just now replying to comments from over a week ago :) I'm hoping things slow down next month! Thanks for the sweet comment about the cupcakes! Hey, you are making your own recipes these days. I noticed that you are posting them on your site, so they must be yours. Hey, by the way, I kept my maiden name also. Glad I'm not the only one :) I seem to be in good company!